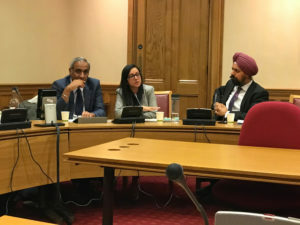 Last Wednesday the NSO held its UK Parliament Week event in the House of Lords with guest speakers Tanmanjeet Singh Dhesi MP, Mandip Sahota and Gurpal Virdi. The NSO was an official partner with UK Parliament Week in a year we commemorate the centenary of women’s suffrage and the right for women to vote in Britain. Giving an example of how individuals can make a difference, he described how he used a pen name ‘Victor Pendry’ to highlight discriminatory treatment of Sikhs in Punjab, at a time when the largely Hindu owned media in India automatically rejected anything coming from a Sikh. Dhesi the MP for Slough, highlighted the importance of being proactive and talked of his efforts to lobby (cross-party) for The National Sikh War Memorial Trust (NSWMT). He talked of how ‘socially minded activists’ also have a key role in today’s digital age. Echoing these views, Mandip Sahota Strategist & former Civil Servant said, ‘We’re all change-makers – so it’s important to understand how to navigate structures of power. This is your Parliament.’ She was clear that ‘megaphone diplomacy’ has its place, but conversations in private are sometimes also as powerful and that we must build relationships to succeed. Summing up, she emphasized effective engagement is achievable, but we must be strategic, clear and ambitious. You can access the UK Parliament Week resource produced by the NSO in partnership with UK Parliament Week here. 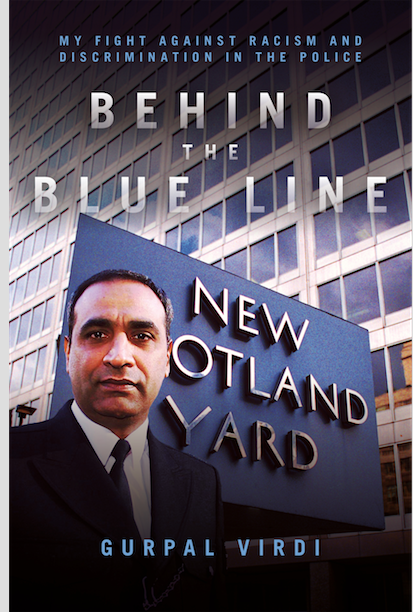 If ever you need a reference point on one man’s battle against institutional racism, then we recommend you get a copy of Gurpal Virdi’s book out today – Behind the Blue Line. It is fair to say Virdi has been through it all. In 1998 as a police Sergeant in the MET he was falsely accused (and dismissed) for sending racist e-mails to himself, and other BAME officers and was subsequently exonerated. On his reinstatement to work, he says his career was essentially over because he’d spoken out and challenged racism in the police. However, what would have deterred a lesser man didn’t stop Virdi. He has successfully taken the MET to two industrial tribunals for discrimination, and bravely gave evidence to the Macpherson inquiry into the death of Stephen Lawrence – when he knew of the consequences. He is also the subject of the VIRDI inquiry report. After his retirement, in 2014, he decided to enter local politics as a Labour candidate. Just before the election, he was falsely accused by the MET of a sexual offence against a minor and abandoned by many of his friends, so called colleagues and the Labour Party. He stood and won as an Independent. In 2015, a jury took 50 minutes to clear him of charges from an alleged incident in 1986. The presiding judge, His Honor Judge Andrew Goymer said a conspiracy may be behind the case. Despite his lengthy battles for justice and equality, Virdi remains a man who encompasses the Sikh ethos of chardi kala, or everlasting optimism. We at the NSO have worked with Gurpal Virdi for many years and collaborated with him during his role at the Metropolitan Police Sikh Association (MPSA). Our Director, Lord Singh of Wimbledon was incensed at the allegations leveled against Virdi in 2014 and supported him during the trial. We don’t often give book recommendations, but Gurpal’s journey in Behind the Blue Line is the rare exception as an injustice can happen to any one of us.